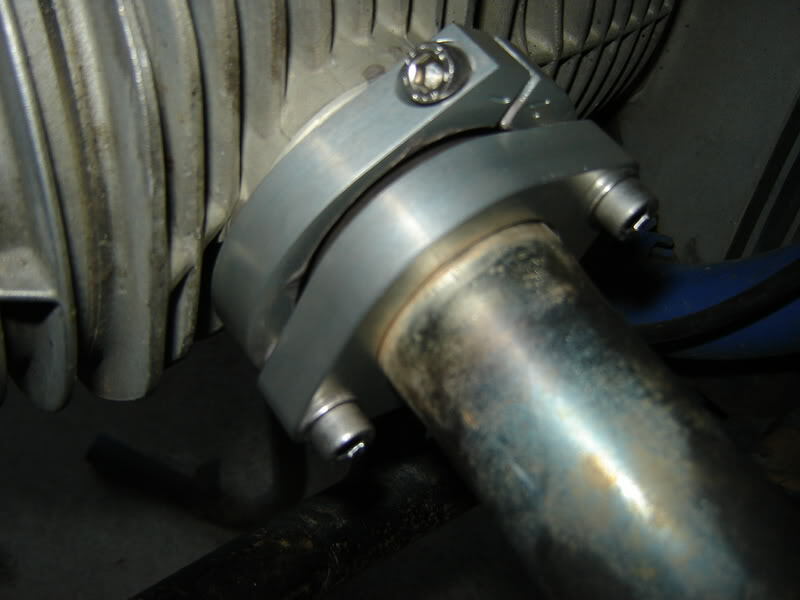 Airhead exhaust nut alternative installed. Discussion in 'Airheads' started by Kokopelli, Feb 25, 2007. 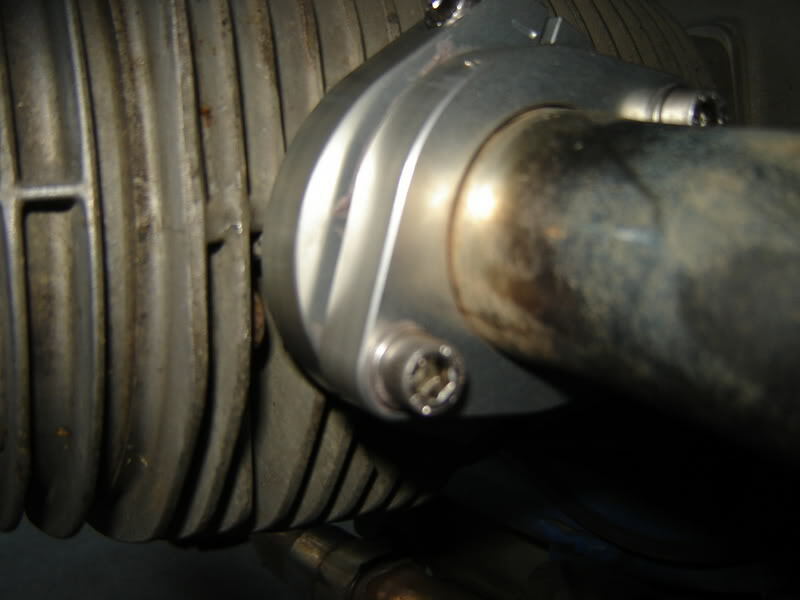 Some of you may remember that I've had a bit of trouble with loose exhaust headers due to the exhaust header threads being damaged. I have ordered my new set up from here http://www.price.gmxhome.de/sternmutterersatz.html . Walter Price sells these for 97 Euro excl. German tax and plus freight, or $163 including freight in our money (NZ Dollar that is). His service is excellent they were shipped last Monday and arrived lunchtime today. 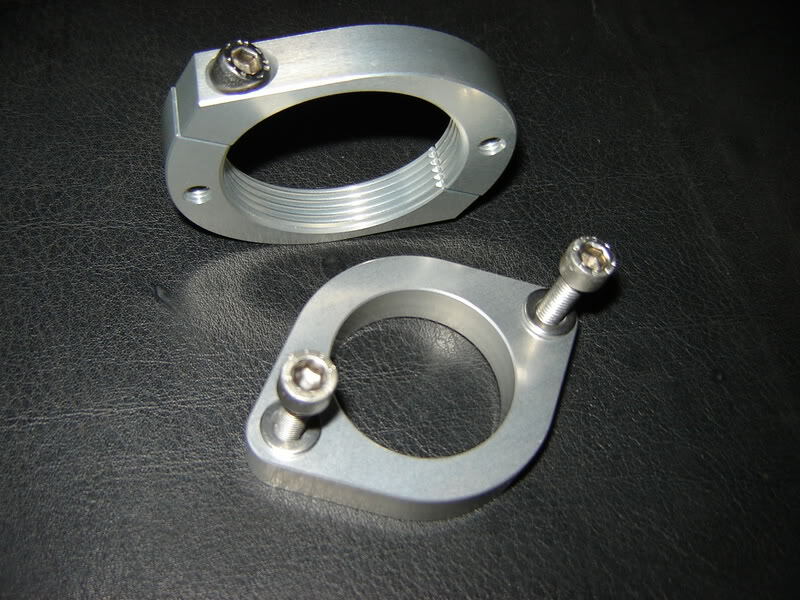 As you can see the components are a high quality alloy and extremely well machined. 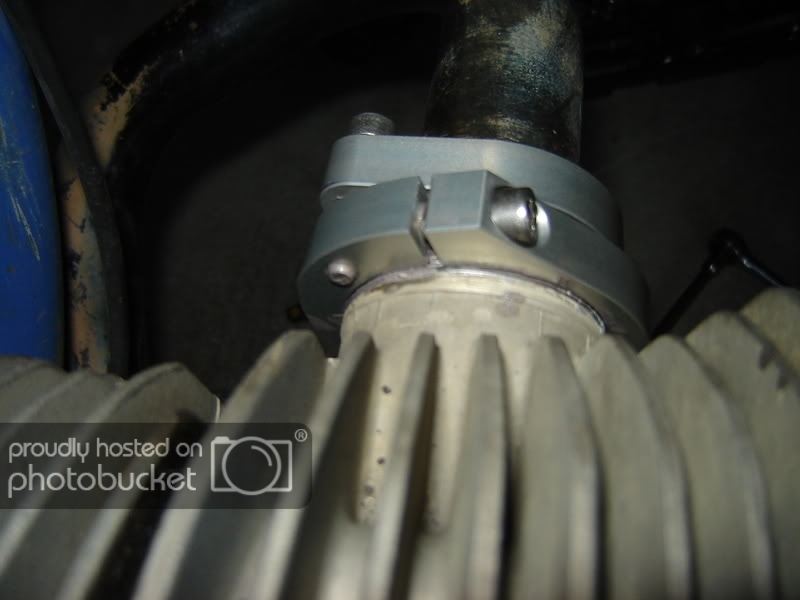 Notice the tread on the part that clamps to the head. It matches your old thread perfectly. It took me a little while to work out which way to align them so I could easily reach all the screws. However, the installation is a breeze, especially if your threads aren't damaged. I've used a bit of Wuerth high temperature grease just to be sure. You don't need to tighten up the screws much to get excellent grip, as it is holding on to the thread anyway. From now on I can make adjustments with an Allen key. Admittedly the look may offend purists, but it saved me a bunch of money for the repair and I actually like it. Plus you can't argue about the practicality. There were no leaks after start up and the headers are fixed in place tightly. Kewl! I didn't know that was out there. What a great idea! thanks for the writeup. I'll keep those in my notes. I wonder why they don't offer a 32mm solution? Seems like an easy CNC change. Slicker then a twin dicked dog!! I think they do offer different sizes. I wonder why they don't offer a 32mm solution? Never mind; I was thinking OD not ID. I like the fact that I don't need to lug around that enormous exhaust nut wrench on a big trip. I'm going to check this out right now, thanks for the tip! But outta habit....when changing the motor oil,I would have to remove the right header to replace the oilfilter anyway. Soooo...,I would "Never Sieze" the threads after filter replacement. I then would do the left side header nut also. Every bit of about 10 minutes to loosen re-lube and tighten. No-biggie....and never any problems! Preventative Maintenence....goes along way baby!!! Good for you, mine was like that when I bought it. I like the fact that I don't need to lug around that enormous exhaust nut wrench on a big trip. I use a stick of wood about 1 inch OD tapering, a largish rock .. place narrow end of stick to a fin on the bm nut .. and hammer with the rock. That does the job of stopping the noise. Both of these picked up beside the road. At home I use a nice bit of bilet al made up to fit. Thanks for the info Kokopelli. A very nice fix. But I'd want a lot of antisize not just a bit! And I'd advise you to reapply the paste every year to ensure the new stuff does not size up too. Well every two years might do, along with the fresh brake fluid? I'm not sure why you would want to put anti-seize on the part that attaches to the cylinder head. That part isn't screwed on, it is clamped on and as near as I can tell you would never need to remove it. In fact if it were seized on it might hold even better. I think on the website he says that you can put seize on or not, your choice. I could be wrong as my German is a bit rusty and Babel Fish made for entertaining though not terribly informative reading. You are probably right, but I can't see it being a problem either. One day I might want to go back to the original set up and re-use the clamps elswhere. Considering some of the more "out there" schemes that I have seen on advrider, these things are very much down to earth and value for money. By the way, I have no commercial interest in the product. I've put my money where my mouth is and have purchased and installed the lock nuts. Now I am telling you guys about it. That's all. Excellent find. I know someone who could use them. Very cool! The only way it would be nicer is if fins were machined onto it like the original exhaust nuts. It costs me $55 to have the threads repaired - and there's no way to tell they were ever stripped. But for the off chance one gets stripped and I'm not able to get it repaired right away, this would be a great solution. You're kind of hard on those exhaust nuts, Frank! 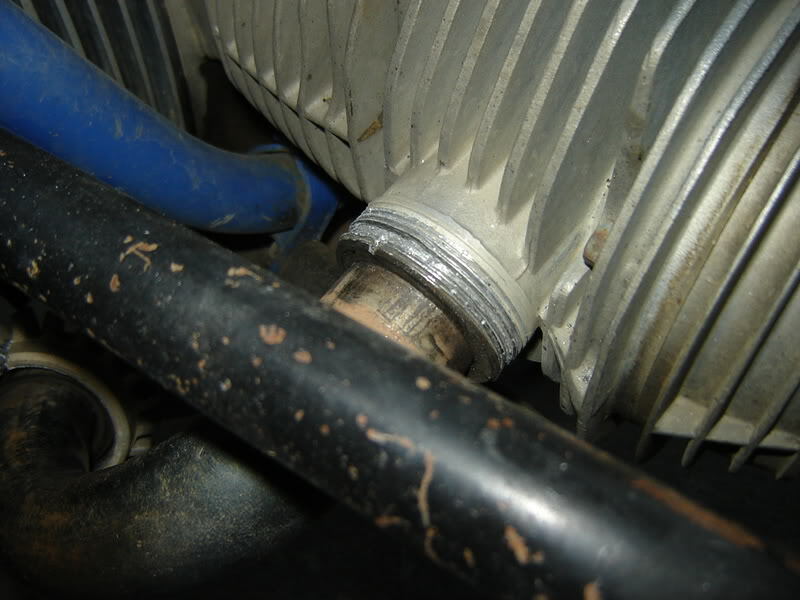 You know, it is possible to purchase a short version of the exhaust nut wrench - a steel head that contacts the fins and has a 3/8" square hole to accept a socket wrench. I believe Ed Korn makes them. Is that a problem with the roads in Australia that the exhaust loosens up? Or is it the way you ride? Very cool! The only way it would be nicer is if fins were machined onto it like the original exhaust nuts. It costs me $55 to have the threads repaired - and there's no way to tell they were ever stripped. That's a very good price. I was quoted a whole lot more for the job. By the time you factor in shipping to the States, it might not be feasible for you, but when I've had stuff shipped from Australia it hasn't been that much. The guy here who does it created his own die for the threads. He grinds back the old threads, builds up the area with the welder, then cuts new threads. I agree, it's a great price.